The Challenger 1 SCM 100 Tractor Front Mount Sweeper has been used in the construction industry for many years due to its robust design. Regardless of its application, such as use on a construction site, asphalt plant, runway, raceway, warehouse, parking lot or beyond this sweeper is built to last. 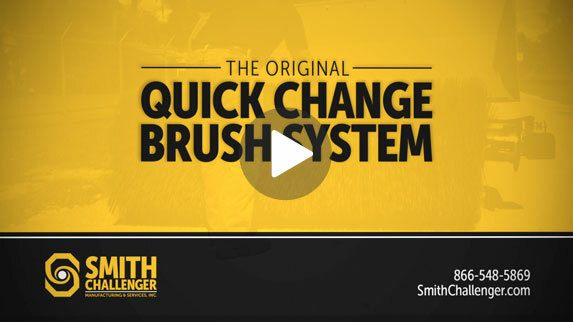 Its hydraulic Quick-Change Brush System allows for the brush to be changed on site in approx 2 minutes. Engineered with innovative prowess, this sweeper requires minimal replacement parts and often outlasts the very tractor it is mounted on. Weighing in at approximately 1400 Ibs, the Challenger 1 SCM 100 Tractor Front Mount Sweeper has a sweeping angle of 40 degrees right and left (HYD), a tractor with 40 – 60 Horsepower is the ideal size. The sweeper has an oil capacity of approx. 24 gallons, a self-cooling oil reservoir, hydraulic brush drive, a brush frame lift of (approx.) 36 inches, dirt deflector and more. This tractor front mount sweeper includes a variety of options as well, such as a water mist system and custom tires and wheels. At Smith Challenger Mfg., we can outfit a tractor to meet any customer’s individual specifications, call us today—let us know your industrial sweeping needs and we will accommodate you accordingly.